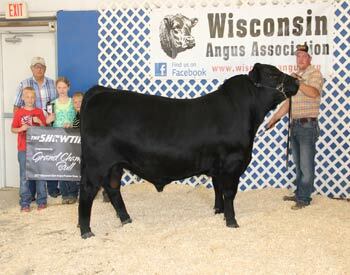 Mindemann Rock Candy 604 won grand champion bull at the 2017 Wisconsin State Angus Association Preview Show, June 4 in Jefferson, Wis. Andy & Leah Mindemann, Watertown, Wis., own the March 2016 son of Plainview Lutton E102. He first won junior champion. Chad Holtkamp, West Point, Iowa, evaluated the 51 entries. Photo by Casey Jentz, American Angus Association. 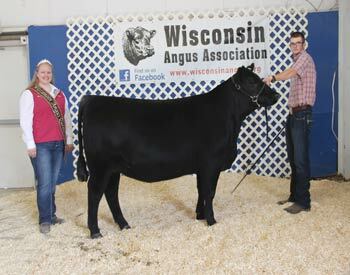 2K Classen 1076 won reserve grand champion bull at the 2017 Wisconsin State Angus Association Preview Show, June 4 in Jefferson, Wis. Kelsi Retallick, Glen Haven, Wis., owns the February 2016 son of EXAR Classen 1422B. He first won reserve junior champion. Chad Holtkamp, West Point, Iowa, evaluated the 51 entries. Photo by Casey Jentz, American Angus Association. 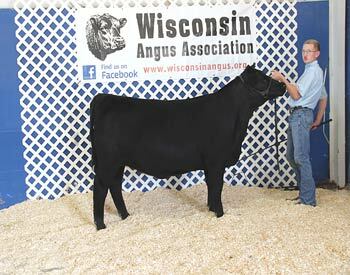 All Royal Blackbird 616 won grand champion female at the 2017 Wisconsin State Angus Association Preview Show, June 4 in Jefferson, Wis. Evan Henning, Janesville, Wis., owns the March 2016 daughter of PVF Insight 0129. She first won junior champion. Chad Holtkamp, West Point, Iowa, evaluated the 51 entries. Photo by Casey Jentz, American Angus Association. 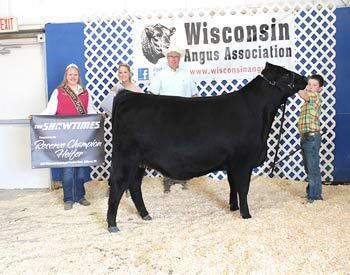 Top Line Lady 5125 won reserve grand champion female at the 2017 Wisconsin State Angus Association Preview Show, June 4 in Jefferson, Wis. Tucker Bayer, Ringle, Wis., owns the October 2015 daughter of EXG RS First Rate S903 R3. She first won senior champion. Chad Holtkamp, West Point, Iowa, evaluated the 51 entries. Photo by Casey Jentz, American Angus Association. 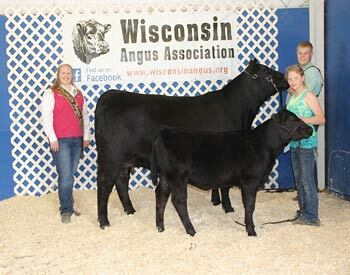 S&R Ellen J503 won grand champion cow-calf pair at the 2017 Wisconsin State Angus Association Preview Show, June 4 in Jefferson, Wis. Kolin Huth, Richland Center, Wis., owns the February 2015 daughter of Bushs Unbelievable423. A March 2017 heifer calf sired by PVF Insight 0129 completes the winning pair. Chad Holtkamp, West Point, Iowa, evaluated the 51 entries. Photo by Casey Jentz, American Angus Association. S&R Entella J624 won reserve junior champion heifer at the 2017 Wisconsin State Angus Association Preview Show, June 4 in Jefferson, Wis. Samuel Henderson, East Troy, Wis., owns the winning heifer. 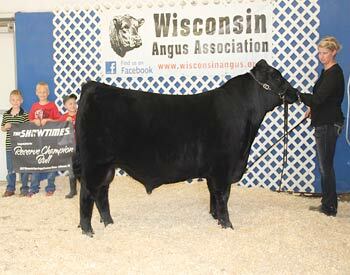 She also claimed champion Wisconsin futurity heifer. Photo by Casey Jentz, American Angus Association. 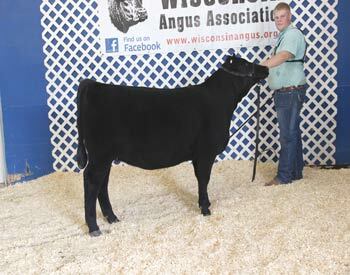 HF Blackbird 6060 won intermediate champion heifer at the 2017 Wisconsin State Angus Association Preview Show, June 4 in Jefferson, Wis. Evan Henning, Janesville, Wis., owns the winning heifer. Photo by Casey Jentz, American Angus Association. 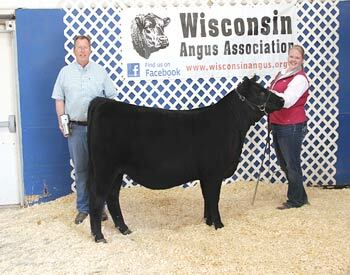 CLF Roxanne 105D won reserve intermediate champion heifer at the 2017 Wisconsin State Angus Association Preview Show, June 4 in Jefferson, Wis. Tucker Bayer, Ringle, Wis., owns the winning heifer. Photo by Casey Jentz, American Angus Association. W G A CJ Beathard 22D won senior bull calf champion at the 2017 Wisconsin State Angus Association Preview Show, June 4 in Jefferson, Wis. Holly Marsh, Union, Ill., owns the winning bull. Photo by Casey Jentz, American Angus Association. 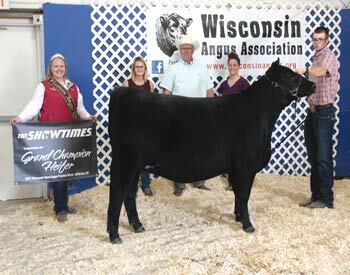 Thornberry Silver 9816 won senior heifer calf champion at the 2017 Wisconsin State Angus Association Preview Show, June 4 in Jefferson, Wis. Claire Hawthorne, Westby, Wis., owns the winning heifer. Photo by Casey Jentz, American Angus Association. 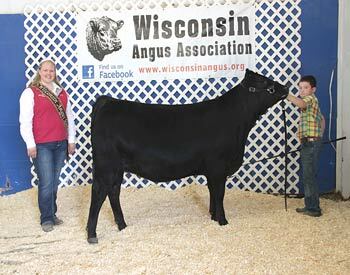 Henning Elba 6145 won reserve senior heifer calf champion at the 2017 Wisconsin State Angus Association Preview Show, June 4 in Jefferson, Wis. Kolin Huth, Richland Center, Wis., owns the winning heifer. 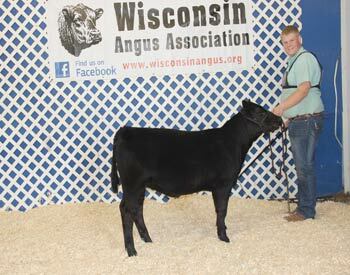 She also claimed reserve champion Wisconsin futurity heifer. Photo by Casey Jentz, American Angus Association. 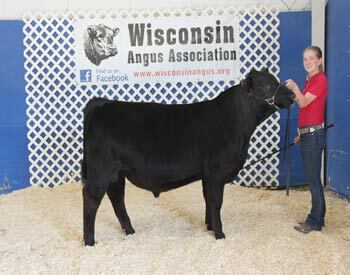 Huth Ellen H71 won junior heifer calf champion at the 2017 Wisconsin State Angus Association Preview Show, June 4 in Jefferson, Wis. Kolin Huth, Richland Center, Wis., owns the winning heifer. Photo by Casey Jentz, American Angus Association.